Ethiopia officially known as the Federal Democratic Republic of Ethiopia is the second-most populous nation in Africa. The population of the country is over 85.2 million people with a growth rate of about 2.6% per annum. It is the tenth-largest by area, having 1,104,300 km2. The capital is Addis Ababa. Ethiopia has a boundary line of a total of 5,328 km and bordered by Eritrea to the north, Sudan to the west, Djibouti and Somalia to the east, and Kenya to the south. Much of the bordering area is relatively low altitude and the central area is covered by mountains and plateaus. Elevation ranges from 136 meters below sea level in the Danakil Depression to 4620 m.a.s.l. at Ethiopia’s highest mountain, Ras Dashen. The urbanization rate is 3.8% and only 17% of the population lives in towns. Ethiopia was a monarchy for most of its history, and the Ethiopian dynasty traces its roots to the 2nd century BC. Ethiopia is also one of the oldest sites of human existence known to scientists today, having yielded some of humanity's oldest traces. Ethiopians maintained their freedom from colonial rule with the exception of a short-lived Italian occupation from 1936-41. In 1974, a military junta, the Derg, deposed Emperor Haile SELASSIE (who had ruled since 1930) and established a socialist state. The Derg regime was over turned in 1991 by Ethiopian People's Revolutionary Democratic Front (EPRDF). A new constitution was adopted in 1994. The federal democratic republic of Ethiopia comprises of nine member states. The federal government and the member states have the legislative, executive and judicial power. The house of people’s representatives is the highest power, to be elected in every five years, by direct people’s participation. There is also similarly organized law making body at the regional level commonly known as the state council. In addition to the two major councils, there are also elected councils at the Woreda and Kebele level but their major duty is administrating their respective areas based on the law of the land which is enacted either by the federal or the regional council. The Irst system is believed to be the first property system in the region. The emergence of the Irist system is related with the beginning of sedentary agriculture during the time of late monarchies. The change in the way of life, from hunting and gathering society to agricultural society, is the cause for the beginning of the new social setting and tenure. There are indications and local measuring units (Kelad, Gasha, Hudad,Tmad, etc.) that show the existence of land measurement tradition in the early history. But there is no documented study to show the outline. The first recorded land registration and cadastral survey in Ethiopia was initiated in Addis Ababa in1909. Also during Haile Selassie’s time there was a Ministry of Land Reform and Administration that measured and registered rural land in collaboration with the Mapping Agency until 1974 aiming to create a system of freehold tenure, provide individual titles of land and to facilitate land sales. The cadastral plans were based on isolated surveys of the town administrations. The urban land registers were also kept by municipalities and there was no organized land register for rural lands. The federal government and the regional governments (states) have different responsibilities. The responsibility of the federal government is enacting framework laws and policies on land and other natural resources. The regions are responsible for land administration. They can also enact their own detailed land laws for the facilitation of their land administration functions without contradicting the constitution and the federal framework land law. The responsibility of conducting cadastral surveys and land registration is for the regions. Land and survey records are stored at woreda (district) and Kebele (village) levels but copies and summaries are kept in the regional offices as well. Land registration and cadastral surveys are under the responsibility of one organization. Rural and urban land administrations are responsibilities of different authorities. Rural land administration at the federal level is one core process in the ministry of agriculture. Regions have independent land administration and use authorities or bureau. The regional organizations are sin some regions directly accountable for the regional council and in some others through bureau of agriculture and rural development. Ethiopian mapping agency is responsible for production of topographic maps and establishment of geodetic control points. The involvement of the privet sector in cadastral surveying in the country is minimal, if not none. The role of private sector surveyors is limited to engineering and design surveys. Ethiopian land administration professional association is established in 2009 with the objective of securing the advancement of proper land administration in Ethiopia and promotes general interests of land related professionals in addition to maintaining and extending their importance to the public. The association has 56 founding members. The number of members cannot be an indicator for the total number of professionals in the country as many professionals are not still members due to various reasons. The legal right of licensing private surveyors is given to Ethiopian mapping agency. Even if the right is given for the mentioned governmental institution no license is issued so far and there is no licensed surveyor in the country. Bahir Dar University is the only higher learning institution which gives a four years BSc level training in land administration. Currently more than 500 students are enrolled in regular, summer and continuing programs and more than 100 are estimated to graduate every year. Related general courses in surveying, engineering, economics and law are also given by other Universities. Technical surveying is also given by technical schools in every region at diploma level. The initial objective of the land administration system was attaining tenure security to small scale farmers. The data collected for land tenure purpose is currently used as input for tax collection and valuation for the purpose of compensation. The use of land administration data for land use planning and development is minimal so far. The contribution of the system for market is only by recording and by giving protection for land rental and lease contracts. Land is a public property and not subject for sale in Ethiopia. Holding right in perpetuity is given for small scale farmers. State or government holdings are those neither private nor communal. The administration of state holdings is the responsibility of the regional land administration organizations. Land administration, especially the rural land administration system was designed for attaining tenure security. The registration program has two major steps and as a result the book of holding two different levels (primary and secondary). The primary book of holding is issued only by using traditional measurements and descriptions. Therefore no map or plan is attached to the primary book of holding. The aim of primary book of holding is to change the informal land rights (without any legally recorded evidence of holding right) to a registered and legally recognized formal right. The process involves land holders and their elected representatives (land administration committees). The data will be transferred to a land register only after approval by public hearings. By using this process over 7 million land holdings are registered in four major regions in less than ten years. The primary books of holdings will be upgraded to secondary books of holdings after the parcels are surveyed. Digital and coordinated maps will be prepared as a requirement for second level book of holding. The attempt of upgrading to second book is at pilot level. Based on the result of pilot projects way of working is developed, methodology tested in two kebeles and 1600 books of holdings are upgraded to second level. In this system various techniques and technologies are accepted to be used as a tool depending on the relative and absolute accuracy needs of different holding types. Cadastral maps will be digital from the very beginning and connected to computerized registration system. He regional states are responsible for land administration. The rural and urban lands are administered by different institutions. As a result of this there is significant difference between urban and rural cadasters. In urban areas a parcel is the smallest unit for both cadastral surveying and property registers. Property and parcel corresponds to each other since most people have only one parcel or property. The other major difference is the lease hold right for defined period is the major tenure in urban areas while holding right for indefinite time is the dominant tenure in rural areas. Parcel is the smallest cadastral unit with unique identifier for both rural and urban lands. The equivalent term for property in the context of rural lands is holding right. A holding right can be obtained with in a Kebele boundary and can be a collection of one or more parcels that are not adjacent to each other. Property therefore is the collection of parcels, mostly 3-4, belonging to one owner. Fixtures (buildings, permanent trees etc.) are parts of property records. Ethiopian land administration system has textual and spatial components. Textual Component includes, but not limited to, the description of the land holder, family members, his address, bordering land holders, fertility status of the parcel, encumbrances if any and the like. The spatial component shows a graphical representation of the parcel together with parts of adjacent parcels and unique identifiers. The primary book of holding is issued without any formal plan or map. The size is described using local measuring units. Location is described by listing the bordering land holders in the east, west, north and south directions. Boundary description at primary book of holding stage can be said very general. For secondary book of holding coordinated digital maps will be attached. Boundaries are fixed. Maps can be produced using ground surveys or remote sensing tools as long as they can meet the accuracy needs of a specific holding type. Taxes are collected based on the information in the register book. The information in the register is also used for valuation which is needed for compensation purposes. The management of state holdings is the responsibility of land administration authorities. The primary book of holding covers approximately 28 million parcels including freehold, state owned land across the nation. There are no strata titles even if ownership of flats in condominium buildings is recently introduced. Computerization is started in one of the pioneer regions and the data of 753,800 holdings and 3,884,485 parcels are entered in to the computer system so far. The cadastral mapping in Ethiopia is limited to urban areas. The urban cadastral plans are not connected to any grid and most of them are still paper based. Where as in the rural areas there are no historical maps that can be used as a base for the new cadaster. The rural cadaster is at development stage. 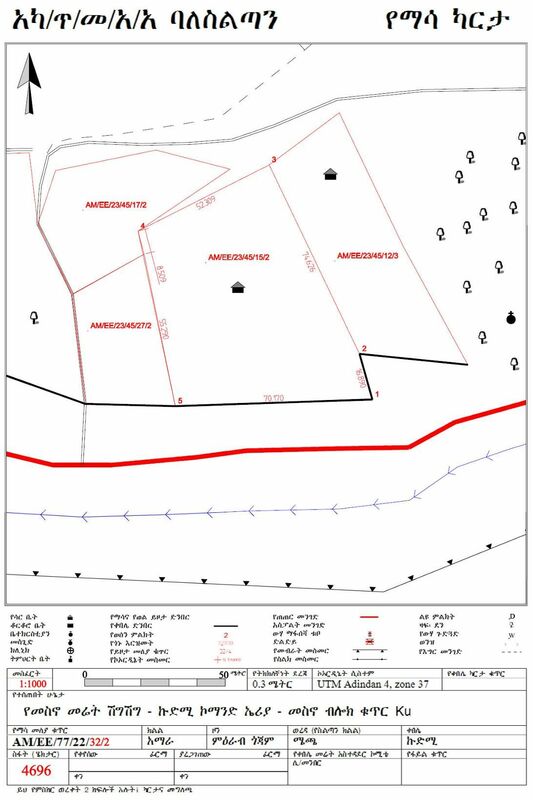 The strategy of the development of the new rural cadaster is to collect digital data from the beginning and to use variety of techniques and technologies to develop cadastral maps suitable for different holding types such as private holdings, communal holdings, state holdings and leased investment lands. The map contains title on the top, north arrow, the plan of the parcel and parts of the adjoining parcel together with major features such as road and foot paths, legend, scale bar, accuracy level, coordinate system and a no of the kebele index map. The map also contains information how the right is obtained, the name and signature of the surveyor, the name and signature of who approved the map, the name and signature of the chairperson of the kebele land administration committee, date area and reference file number. The cadaster especially the rural cadaster is a new initiative. There is no historical or large scale topographic map to use as a base. The initiative by its very nature is resource demanding. On the contrary neither users nor the local governments are able to finance the system. Resource limitation will continue to be the major bottle neck for some time to come. The rural urban dichotomy is another major challenge. The divide if not solved soon will create maps that cannot be integrated in the future. The level of attention given by different regional governments for land administration issue is different. The strengths of the implementing government agencies is also the reflection of the attention given by respective governments. The organizational strength at the federal level is not strong enough to lead progressive regions. The federal institution has to be vitalized to effectively accomplish the expected leading role. The registration of all rural lands is planned to be completed in the coming five years. The major four regions will start issuing second level book of holdings. The data is planned to be fully computerized in the coming five years. Capacity building is the major undertaking on progress. Laws and regulations are under review for the facilitation of the planned five years plan.